Farmina is nature and science in perfect harmony. Their mission is to develop the best all-natural, nutritious, and scientifically validated food that they will love. That’s why in their kitchen, they mix and cook only the finest raw ingredients following strict guidelines set by nutritional experts. 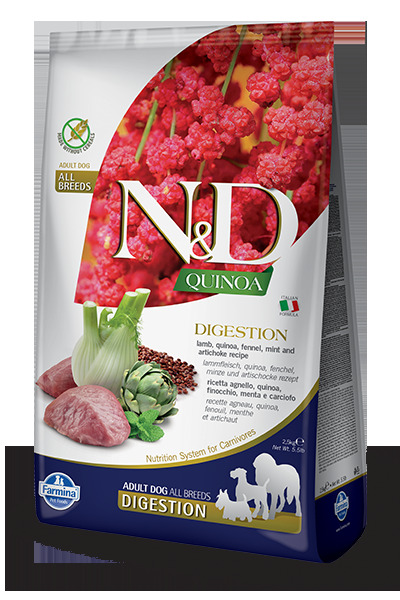 With thise expertise, they have designed a scientifically validated diet specific to a carnivores nutritional needs. Dogs are our four-legged family members that emanate the emotions found at home. With nutrition as the basis of their wellbeing, a balanced meal can leave them feeling happy and joyful which they can then pass onto you. That’s why their motto is: Happy Pet, Happy You. INGREDIENTS: Fresh grass fed lamb (22%), pea starch, dehydrated lamb (12%), chicken fat, dehydrated whole eggs, quinoa seed (8%), dehydrated herrings, herring oil, dried fennel (2.0%), dried mint (2.0%), dried artichoke (2.0%), inulin (0.6%), fructooligosaccharides (0.4%), yeast extract (0.4%) (source of mannan-oligosaccharides), calcium carbonate, psyllium, potassium chloride, salt, glucosamine, chondroitin sulfate, vitamin A supplement, vitamin D3 supplement, vitamin E supplement, ascorbic acid, niacin, calcium pantothenate, riboflavin, pyridoxine hydrochloride, thiamine mononitrate, biotin, folic acid, vitamin B12 supplement, choline chloride, beta-carotene, zinc methionine hydroxy analogue chelate, manganese methionine hydroxy analogue chelate, ferrous glycine, copper methionine hydroxy analogue chelate, selenium yeast, DL-methionine, taurine, L-Carnitine, aloe vera gel concentrate, green tea extract, rosemary extract, mixed tocopherols (a preservative).